Most people spend January 1st nursing hangovers from a raucous night of drinking, partying, and staying up late. Instead, Brian and I spent January 1st running the Resolution Run 5k in 30 degree weather. It wasn't exactly how I imagined spending New Year's Day, but now that my partying days are mostly behind me (I only drank one margarita and went to bed promptly at midnight...yawn), it wasn't a stretch for me to wake up early the next day and run. Besides, it was a pretty fitting start to 2010 considering my plans to train for and run the Country Music half-marathon in April. We bundled up and drove downtown where we met other like-minded (read: crazy) people at Hall of Fame park. We picked up our packets, and with numb fingers attempted to pin on our racing bibs. I managed to stab myself multiple times, but luckily my fingers were already frozen at that point. Then we followed a mass of people to the start line and several minutes later we here the BANG! of the gun go off. For the first mile, I was on fire. 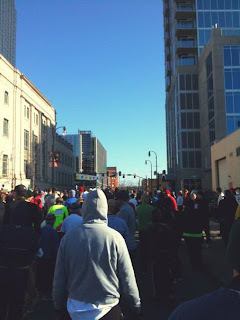 I took off running past all kinds of people, but by the second mile I was hitting the proverbial "wall." My face was numb from the cold air and my shins cried out in pain. Still- I didn't stop. I kept running to the beat of my iTunes playlist and before I knew it, I was crossing the Shelby Street pedestrian bridge and crossing the finish line with a race time of 30 min. and 50 seconds! Not bad considering it equals out to less than 10 minutes per mile. In the end I placed 23rd out of 68 women in my age group. Once I crossed the finish line, I realized I was the equivalent of drunk. I stumbled around looking for Brian and managed to randomly lay down my gloves and walk off without them. Good thing they were $0.99 cheapies. I quickly downed some free cornbread and water and then headed for the warmth of my car. On the way home we stopped at the Wendy's drive-thru and splurged on burgers and fries, thus negating any calorie deficit we may have earned that morning.